Otis Brown Jr. (“Brownie”) is a third generation horseman and known world wide for his exceptional eye for young talent of both horse and rider. He has run Brass Lantern Farm for over thirty years. 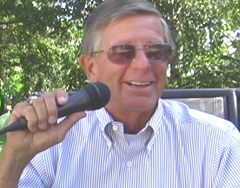 Originally based in Brentwood, Tennessee, Brownie and former rider Patty Johnson Stovel claimed fame with numerous Championships in hunter divisions throughout the Country, including wins in the International Hunter Futurity, and International success in Grand Prix Show jumping including Olympic trials and the World Equestrian Games. “Brownie” is a popular judge across the country and an articulate clinician. His judging venues include all the top shows and circuits – WEF, Ocala, HITS in the Desert – and all of the top rated national horse shows. Brass Lantern is now in Georgetown, KY. where Brownie continues to teach students and assist young professionals in the industry.